Steve Sechi on Facebook wrote: Hi all - just wanted to let you know that Scott Agnew has been removed and permanently banned from the Talislanta Facebook page for illegally selling print-on-demand versions of numerous Talislanta titles through Amazon.com (illegal, because he no longer had the license to manufacture and sell Talislanta books). After I notified Amazon of this, they agreed to remove all of the POD Talislanta titles from their site. Scott also did the same thing with the Atlantis book, causing Jerry Grayson of Khepera to contact Amazon as well. It was Jerry who discovered what Scott was doing, at which point he notified me. Hence the reason for removing Scot from this list. If anyone here happens to come across any POD Tal or Atlantis books being sold anywhere online, please let Jerry or me know. 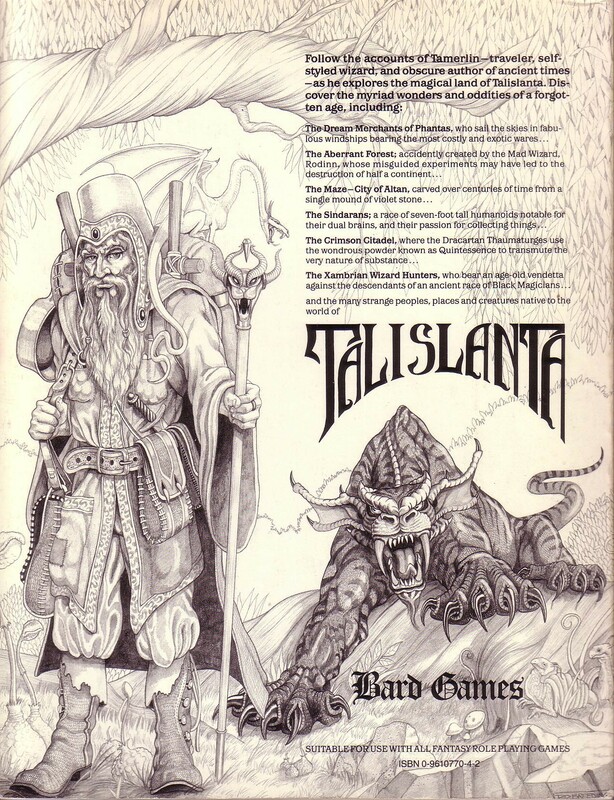 Thanks, and once again thanks to all of you for supporting the Talislanta game. I thought that was pretty scuzzy. 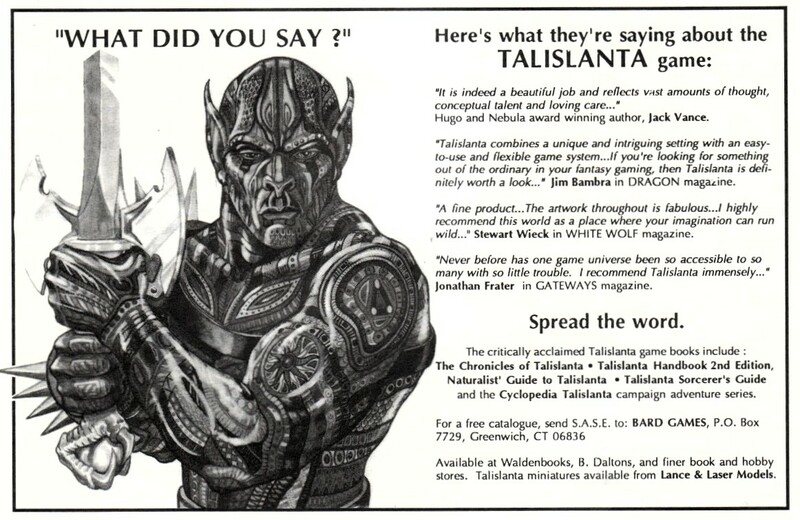 SMS was kind enough to make the entire library of Talislanta books available for free as PDFs. That is a gift to the fans (but a conditional gift for personal use only). SMS says please keep an eye out for anyone else selling these illegal Print on Demand books and let him know about it. I can't believe Scott was doing that. I've heard lots of talk about PoD Tal books on Amazon. There were cases where people ordered from Amazon and received a PoD product, being heavily disappointed. Other times people wanted hardcopies of the PDFs and were referred to Amazon. I wonder how much money he made doing this?! It sickens me to my core . I'd really like to see SMS do something about it. Notifying Amazon just seems so weak. Then again I'm a huge activist for IP Rights & Protection. Perhaps he can get a record of the financials associated with the Tal sales to see if pursuing legal action would be financially viable? Legal action to recover any profits might take a lot of time and money. So SMS could end up spending more than he gets back (or he could loose time when he would be doing his music stuff). A DMCA notice (from SMS) is something that would be a lot easier to do. All he needs to do is demand that something illegal gets taken down and the people selling it will take it down. I am no lawyer, but I believe that once you know how a DMCA notice works, you could just save one and copy and paste in new information about any future dodgy product, to have a document that does the job. Ed Heil has also started a discussion about this at the Talislanta group on Google+. There has been some talk about SMS doing PoD products himself (back at Facebook). It is not something he has time for himself, but he may allow someone else to do it for him. If I hear any more news, I'll start a new thread (unless someone else beats me too it). Very true David. Its just a tragedy. Grawr! Big Mac wrote: Legal action to recover any profits might take a lot of time and money. So SMS could end up spending more than he gets back (or he could loose time when he would be doing his music stuff). That's pretty much the avenue things seem to be going - SMS doesn't have the time/money to pursue any legal action against Scott/Morrigan for what would likely be a small amount when Amazon is already taking the links/POD down. Its a real shame SMS even has to deal with a situation like this. His gesture of giving the books away for free is unmatched in the hobby (to my knowledge). For someone to take advantage of the fact he is no longer monitoring the game closely is so very wrong. Especially considering he had a relationship with SMS at one time. I think it many find it very easy to steal from a faceless stranger. But Scott knew SMS and probably better than most of us. It makes me angry and sad all at the same time. This is really disappointing news. Buyers bear some responsibility too if this is allowed to continue. Mulsiphix wrote: Its a real shame SMS even has to deal with a situation like this. His gesture of giving the books away for free is unmatched in the hobby (to my knowledge). For someone to take advantage of the fact he is no longer monitoring the game closely is so very wrong. Especially considering he had a relationship with SMS at one time. I think it many find it very easy to steal from a faceless stranger. But Scott knew SMS and probably better than most of us. It makes me angry and sad all at the same time. Yeah. Part of me would like to chalk it up to Scott perhaps being more focused on other things - his kid's in college, he recently remarried, he moved and opened up his own business, etc etc - and never followed up with taking the POD down from Amazon. From what (admittedly little) I know of Amazons POD payout department, they don't send a check everytime you sell a book, but rather when you reach a certain dollar amount that they owe you. However, I think that amount is somewhere in the $100 range. So, maybe Scott neglected to cancel the POD stuff and told SMS and Jerry that it was taken care of because he hadn't been paid in a while. Of course, I could be wrong about all that. I don't know what the Tal POD books sales were like. Still, it's a bad deal. There's been some other good news for Tal since this story came to light, but that's probably fodder for another thread. DMCA makes it easier to protect your IP than to recover your pound of flesh. The important thing is to protect Talislanta so that it can one day return (in some form or other) if/when SMS wants to do that. There is the SRD, which gave away the rules system for 3rd Edition D&D. That has been pretty important to the gaming industry as a whole, but it is a system, rather than an actual world (and it is just one edition - WotC neither gave away pre-3e rules nor post-3e rules). If you look at worlds, there is an Open Game Content world called Blackmarsh. But that is just one book, rather than 20 years worth of a fairly large product line. I think I've seen a few other worlds given away for free, but they were all small product lines or one-shots. So SMS's gesture is not the only free thing I've seen, but I think it must be the largest most-significant freebie in gaming history. Havard wrote: This is really disappointing news. Buyers bear some responsibility too if this is allowed to continue. According to SMS, Jerry Grayson had to make a couple of test purchases (both a Tal title and an Atlantis title) to confirm that these were unauthorised PoD books. So it must have been fairly hard to work out they were books that were not old stock from the description itself. SMS really likes Talislanta fans, so if someone has accidentally bought one of these unauthorised PoD books, instead of old books - which are totally legal to sell, I doubt SMS would be angry at the fan. SMS is spreading the word in the hope that any fans that spot other places where these books might be on sale, can help him get those sales outlets shut down. But it may only be the fans who actually bought dead-tree copies, who are able to look inside and see the signs that they have Print on Demand books instead of the original books. writermonk wrote: Yeah. Part of me would like to chalk it up to Scott perhaps being more focused on other things - his kid's in college, he recently remarried, he moved and opened up his own business, etc etc - and never followed up with taking the POD down from Amazon. From what (admittedly little) I know of Amazons POD payout department, they don't send a check everytime you sell a book, but rather when you reach a certain dollar amount that they owe you. However, I think that amount is somewhere in the $100 range. So, maybe Scott neglected to cancel the POD stuff and told SMS and Jerry that it was taken care of because he hadn't been paid in a while. Of course, I could be wrong about all that. I don't know what the Tal POD books sales were like. There is good news! See the SMS considering new Tal options thread. I agree, but only if the buyer is aware it is a POD that is not authorized. Agreed. BM has a good point about this not being so easy to spot.